Zlomeniny diafýzy pažní kosti - kde se nacházíme? Humerus Shaft Fractures - Where Are We Today? Humeral shaft fractures account for about 1-3% of all fractures. These fractures are regarded as the domain of non-surgical management. This is certainly still the contemporary view but there is an obvious trend towards surgical stabilization. Surgical treatment of humeral shaft fractures has nonetheless been greatly facilitated by the development of new implants. In particular, a new generation of nails that general permit immediate mobilization have become available for improved management of longitudinal and multi-segmental fractures. Retrograde and antegrade nails have advantages and disadvantages and selection procedure is often based on the distal or proximal location of the fracture. Plates also offer an alternative for certain indications and have advantages at the proximal and distal shaft in particular. If there is primary lesion of the radial nerve, exploration is not very advisable, but in the absence of remission exploration can be conducted after several months with the same degree of success. Since the published literature offers no comparative studies with a high level of evidence, our statement can only be regarded as an up-to-date recommendation in the hope that future prospective randomized studies will address this issue. - in the 5th - 7th decades of life, especially in women after a simple fall. Humeral shaft fractures are generally simple fractures of the mid-diaphysis. The incidence of primary lesion of the radial nerve in association with humeral shaft fracture is quoted at 11.8% on average(41). In more elderly people, humerus fracture due to a fall is generally proximal, sub- or infracapital. There is a predominance of women due to post-climactic demineralization of the skeleton (43). In principle, the mechanism of injury may be direct or indirect. In the case of indirect force the accident involves falling onto the elbow or hand. Direct force is applied during impact of the folded arm with an edge or, more often, during direct impact of the abducted arm with an obstacle. Depending on the mechanism, the fracture may include a bending wedge. High energy trauma often produces multifragmentary and/or severely dislocated fractures. Accidents in trade and industry, e.g. an arm is pulled into an industrial machine or run over, are associated with substantial soft tissue injuries and even subtotal amputation and/or proximal avulsion lesions of the plexus or vessels. The severity of these injuries can be classified with reference to the Injury Severity Score (ISS). On the Abbreviated Injury Scale (AIS) a score of 2 is given to closed humerus fractures, and a score of 3 to open or displaced fractures, comminuted fractures, and simple fractures with lesion of the radial nerve. In his 1964 article entitled 'Against the operative treatment of fresh humeral shaft fractures" Lorenz Bohler wrote: "Of all shaft fractures of the long bones humeral shaft fracture is the most benign. Apart from very few exceptions it can almost always be treated non-surgi-cally in the simplest way by appropriate bandaging. It is only necessary to know that the most important task of fracture treatment is to achieve a shortening of 1-10 mm, and that, for example, in transverse fractures displacement by a whole shaft width with functionally and cosmetically unimportant shortening is irrelevant providing there is no noteworthy axial or rotational deformity" (6). Since then non-surgical treatment of humeral shaft fractures has retained its high status. As for fractures affecting other parts of the body there has been a gradual change of paradigm in recent years that is also relevant to the management of humeral shaft fractures. On the one hand, changes have arisen from advances in surgical methods and implants, on the other hand, patient attitude has become increasingly demanding, whereby rapid stabilization of the injured extremity and the fastest possible restoration of function is expected. Internationally the most widely accepted classification is that of the Association for the Study of Internal Fixation (AO/ASIF) as published by Miiller and Nazarian (27). Every anatomical region gets a number starting with the humerus as number "1", forearm number "2", femur number "3" and lower leg "4". Then it describes the bone segments into proximal "1", shaft "2" and distal "3"- As consequence humeral shaft gets the number "12". 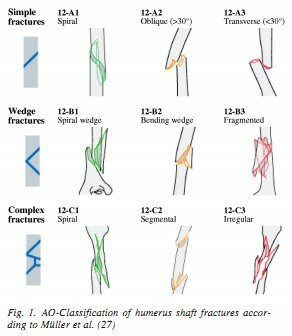 Then the fractures are classified in simple = a, wedge = b and complex = c (Fig. 1). In principle, prognosis is favorable for healing of humeral shaft fractures because of the soft tissue situation and the physiological weight bearing axes. This is the conclusion drawn by Sarmiento et al. from their retrospective study of 920 humerus fractures treated non- surgically, of which 67% were available to follow up (34-36). Non-surgical treatment consisted of initial immobilization of the fractured arm at an angle of 90° at the elbow followed a few days later by application of a brace. Pseudarthrosis formed in only 6% of open and less than 2% of closed fractures. The functional outcome was good in 98%, refracture was rare and was also treated non-surgically. The average time to healing was about 11 weeks. Good functional outcomes were achieved even in fractures displaced by one shaft width, axial deformities up to 20° and shortening of up to 1 cm. In recent years a trend has developed towards surgical management of humeral shaft fractures. The obvious advantages of surgical treatment are, on the one hand, a shorter immobilization time, greater patient comfort, fewer essential radiological examinations, more rapid rehabilitation and shorter periods of work incapacity (20, 30). The disadvantages are general surgical risks, especially possible nerve injuries with consequent motor and sensory deficits. The indications for which surgical management is generally recommended are open fractures with or without concomitant vessel and nerve injuries and also deteriorating neurological deficit, multi-segmental fractures, pseudarthroses and failure of non-surgical treatment (20, 23). Additional indications may included, for example, positioning problems with polytraumatized patients and improvement of intensive care, bilateral humerus fractures and severe obesity (20, 25). A posterior approach is the standard approach to the mid and lower shaft regions. As a rule, the standard implant is the broad or narrow 4.5 mm plate [generally the fixed angle "Locking Compression Plate - LCP" (14)]. Biomechanical testing has revealed an advantage of the 4.5 mm plate over the 3.5 mm plate but has shown no advantage of fixed angle screws over the conventional Dynamic Compression Plate (DCP) (9,18, 29). Precise documentation of the intersection of the radial nerve with the plate reduces the risk of damage at subsequent surgery. A screw in every second plate hole with anchorage in a total of 4 cortices is sufficient to stabilize locking plates (17, 40). In the literature, comparison with intramedullary techniques has produced varying outcomes. Some authors report better results with intramedullary implants and think that plates should be reserved for specific indications only. Others report a higher complication rate wtih nails and tend to prefer plates (12, 25). Putti et al. also describe a higher complication rate with nails than with plates but found comparable clinical outcomes for both implants (31). Bhandari et al. conducted meta-analysis and concluded that plate osteosynthesis might lessen the risk of re-operation and shoulder impingement but also established that published reports were inconsistent (4). Although good results have been achieved with minimally invasive plate insertion we would not necessarily recommend it, in particular because of the high risk of injury to the radial nerve (2, 3). Plate osteosynthesis is recommended for open fractures, very distal shaft fractures (Fig. 2) and when exploration of the nerve is required (12,15, 20, 28, 32). Additional indications are situations requiring compound osteosynthesis in pathological fractures and the management of an increasing number of periprosthetic fractures. The latter present a considerable challenge to the treating surgeon because of the limited options for screw anchorage in the proximal shaft when bone quality is poor. An additional indication for plating could be very proximal shaft fractures or combined shaft and humeral head fractures (19, 21, 42). Since Kiintscher presented his intramedullary nail and von Hackethal introduced bundle nailing in 1961, numerous intramedullary implants have been developed. In the meantime, the Seidel nail and the Unreamed Humeral Nail (UHN) have become established in clinical routine. The advantages and disadvantages of ante- and retrograde approaches are well documented (1,5,7,24). The improved outcomes reported for retrograde insertion arise from preservation of the rotator cuff in retrograde nailing technique (5, 37). A retrograde approach is generally technically impossible for distal fractures. In shaft and multi-segmental fractures that extend to the very proximal region, nails over a retrograde approach often compete against long plates or nails with a proximal joint component (Fig. 3). Rommens et al. in their collective found that patients with antegrade nails tended to present at follow up with shoulder complaints and those with retrograde nails with elbow complaints, whereby 93.5% of their total sample of humerus fractures stabilized by nailing achieved good to very good outcomes (33). Cheng and Lin in their study also concluded that both antegrade and retrograde nailing procedures yield similar outcomes (10). We do not consider it necessary to conduct endoscopy-assisted intramedullary nailing to preserve the radial nerve (45). A locking nail of the newest generation is the so-called Flex nail (Synthes company). This nail can be inserted in both ante- and retrograde technique. Its flexiblity permits antegrade insertion close to the greater tubercle but away from the joint surface. The risk of shaft disruption during retrograde insertion of the nail is greatly reduced. In the case of mid shaft fractures the satellite wires provide rotational stability thus eliminating the need for additional proximal locking as well as the risk of injury to the axillary nerve (Fig. 4). Early clinical outcomes have been very promising (26). The prevalence of radial nerve lesions after humeral shaft fractures lies between 9 and 18% (16, 41). Grass-mann carried out a survey of 495 traumatology clinics and concluded that even though a wait-and-see policy is recommended in cases of primary radial palsy after humeral shaft fractures based on a high spontaneous remission rate of 90%, nerve revision is often performed anyway in clinical routine. In these cases, it does not seem logical to insert a locking nail in minimally invasive technique because there is direct visualization of the fracture zone and radial nerve. However, the fact remains that total discontinuity of the nerve is rare and the spontaneous remission rate is high (16). Based on systematic literature searches of 391 publications, Shao et al. recommend management as shown in Fig. 5 (41). In any case, they were able to show that early exposure of the nerve did not produce better outcomes than a more cautious approach and therefore recommend an initial wait-and-see policy (41). Wang et al. are also in favor of waiting and recommend a period of 4 months prior to exploration of the nerve (44). 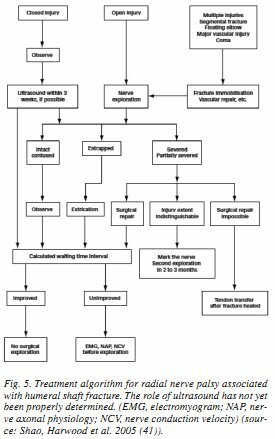 These recommendations are partially based on the fact that functional outcomes after early or late nerve reconstruction do not differ. Secondary damage to the radial nerve after aggressive revision is, of course, also possible and is a risk can be avoided in the 90% of nerves showing spontaneous remission of function (22). In this context, the question arises of which fracture fixation method is associated with the greatest probability of radial nerve damage. Studies on this topic with the relevant level of evidence do not exist and data from isolated retrospective surveys vary from 0 to 10% postoperative radial palsy regardless of the stabilization technique (8). Humeral shaft fracture is regarded as the domain of non-surgical management. This is certainly still the contemporary view but there is an obvious trend towards surgical stabilization. Surgical treatment of humeral shaft fractures has nonetheless been greatly facilitated by the development of new implants. In particular, anew generation of nails that general permit immediate mobilization have become available for improved management of longitudinal and multi-segmental fractures. Retrograde and antegrade nails have advantages and disadvantages and selection procedure is often based on the distal or proximal location of the fracture. Plates also offer an alternative for certain indications and have advantages at the proximal and distal shaft in particular. If there is primary lesion of the radial nerve, exploration is not very advisable, but in the absence of remission exploration can be conducted after several months with the same degree of success. 1. AJMAL, M, O'SULLIVAN, M, McCABE, I, CURTIN, W.: Antegrade locked intramedullary nailing in humeral shaft fractures. Injury, 32(9): 692-4, 2001. 2. APIVATTHAKAKUL, T., PATIYASIKAN, S., LUEVITOON-VECHKIT, S.: Danger zone for locking screw placement in minimally invasive plate osteosynthesis (MIPO) of humeral shaft fractures: a cadaveric study. Injury, 41(2): 169-72, 2010. 3. APIVATTHAKAKUL, T., PHORNPHUTKUL, C, LAOHA-POONRUNGSEE, A., SIRIRUNGRUANGSARN, Y.: Less invasive plate osteosynthesis in humeral shaft fractures. Oper. Orthop. Traum., 21(6): 602-13, 2009. 4. BHANDARI, M., DEVEREAUX, P. I, McKEE, M. D., SCHEMITSCH, E. H.: Compression plating versus intramedullary nailing of humeral shaft fractures- a meta-analysis. Acta Orthop. 77(2): 279-84, 2006. 5. BLUM, I, ROMMENS, P. M., JANZING, H., LANGENDORFF, H.S. : [Retrograde nailing of humerus shaft fractures with the unreamed humerus nail. An international multicenter study]. Unfallchirurg, 101(5): 342-52, 1998. 6. BOEHLER, L.: [Against the Operative Treatment of Fresh Humeral Shaft Fractures.]. Langenbecks Arch. Klin. Chir. Ver. Dtsch. Zbl. Chir., 308: 465-75, 1964. 7. BORENS, O., MOUHSINE, E., CHEVALLEY, F.: [Preliminary results of retrograde nailing of the humerus]. Swiss Surg., 7(2): 76-81, 2001. 8. BRUG, E., JOIST, A., MEFFERT, R.: [Postoperative radial paralysis. Fate or negligence, conservative wait or revision?]. Unfallchirurg, 105(1): 82-5,2002. 9. CATANZARITE, I, ALAN, R., BAIG, R., FORNO, P., BENSON, L.: Biomechanical testing of unstable humeral shaft fracture plating. J. Surg., Orthop. Adv. 18(4): 175-81, 2009. 10. CHENG, H. R., LIN, J.: Prospective randomized comparative study of antegrade and retrograde locked nailing for middle humeral shaft fracture. J. Trauma, 65(1): 94-102, 2008. 11. COLE, P. A., WUDICKS, C. A.: The operative treatment of dia-physeal humeral shaft fractures. Hand Clin. 23(4): 437-48, 2007. 12. CONNOLLY, S., McKEE, M. D., ZDERO, R., WADDELL, J. P., SCHEMITSCH, E. H: Immediate plate osteosynthesis of open fractures of the humeral shaft. J. Trauma, 69(3): 685-90, 2010. 13. COURT-BROWN, C. M., RIMMER, S., PRAKASH, U, McQUEEN, M. M.: The epidemiology of open long bone fractures. Injury, 29(7): 529-34, 1998. 14. FRIGG, R.: Locking Compression Plate (LCP). An osteosynthesis plate based on the Dynamic Compression Plate and the Point Contact Fixator (PC-Fix). Injury, 32, Suppl 2: 63-6, 2001. 15. GEORGIADES, C, MATĚJKA, J., PAVELKA, T., HOUCEK, P.: [Treatment of distal humeral fractures by open reduction and internal LCP-DHP fixation]. Acta Chir. orthop. Traum. Čech., 77(6): 479-83, 2010. 16. GRASSMANN, J. P., JUNGBLUTH, P., BULLERMANN, L., HAKIM, M., GEHRMANN, S. V., THELEN, S. et al. : Radial Nerve Palsy Associated with Humeral Shaft Fractures - Early Exploration or Expectant Procedure? An Analysis Concerning Current Strategies of Treatment. Zbl. Orthop. Unfall., 2010. 17. HAK, D. I, ALTHAUSEN, P., HAZELWOOD, S. J.: Locked plate fixation of osteoporotic humeral shaft fractures: are two locking screws per segment enough? J. Orthop. Trauma, 24(4): 207-11, 2010. 18. JUPITER, J.B., WYSS, H: Stable fixation of osteoporotic fractures and nonunions in the upper limb - life before the "locking plate". Acta Chir. orthop. Traum. Čech., 77(5): 361-4, 2010. 19. KONRÁD, G. G, MEHLHORN, A., KUHLE, J., STROHM, P. C, SUDKAMP, N. P.: Proximal humerus fractures - current treatment options. Acta Chir. orthop. Traum. Čech., 75(6): 413-21, 2008. 20. KOSTLER, W., STROHM, P. C, SUDKAMP, N. P.: [New techniques for bone synthesis on the humerus]. Chirurg, 73(10): 969-77, 2002. 21. KRIVOHLAVEK, M., LUKAS, R, TALLER, S., SRAM, J.: [Use of angle-stable implants for proximal humeral fractures: prospective study]. Acta Chir. orthop. Traum. Čech., 75(3): 212-20, 2008. 22. LEE, Y. H, CHUNG, M. S., GONG, H. S., CHUNG, J. Y., PARK, J. H, BAEK, G H: Sural nerve autografts for high radial nerve injury with nine centimeter or greater defects. J. HandSurg.,Amer. 33(1): 83-6, 2008. 23. LIN, J., HOU, S. M., HANG, Y S.: Treatment of humeral shaft delayed unions and nonunions with humeral locked nails. J. Trauma, 48(4): 695-703, 2000. 24. LIN, J., INOUE, N., VALDEVIT, A., HANG, Y S., HOU, S. M., CHAO, E. Y: Biomechanical comparison of antegrade and retrograde nailing of humeral shaft fracture. Clin. Orthop. Relat. Res. (351): 203-13, 1998. 25. MARTY, B., KACH, K, FRIEDL, H. P., TRENTZ, O: [Intrame-dullary nailing of the humerus shaft fracture]. Unfallchirurg, 97(8): 424-9, 1994. 26. MULLER, C. A., HENLE, P., KONRÁD, G, SZARZYNSKI, M., STROHM, P. C, SUDKAMP, N. P.: [The AO/ASIF Flexnail : A flexible intramedullary nail for the treatment of humeral shaft fractures.]. Unfallchirurg, 110(3): 219-25, 2007. 27. MULLER, M. E., NAZARIAN, S., KOCH, P., SCHATZKER, J.: The comprehensive classification of fractures of the long bones. New York: Berlin Heidelberg, Springer, 1990. 28. NIEMEYER, P., HAUSCHILD, O, STROHM, PC, MULLER, C. A., SUDKAMP, N. P., KOSTLER, W.: Fracture Treatment in the Elderly. Acta Chir. orthop. Traum. Čech., 71(6): 329-38, 2004. 29. O'TOOLE, R. V., ANDERSEN, R. C, VESNOVSKY, O., ALEXANDER, M., TOPOLESKI, L. D., NASCONE, J. W. et al. : Are locking screws advantageous with plate fixation of humeral shaft fractures? A biomechanical analysis of synthetic and cadaveric bone. J. Orthop. Trauma, 22(10): 709-15, 2008. 30. PERREN, S. M.: Fracture healing. The evolution of our understanding. Acta Chir. orthop. Traum. Čech., 75(4): 241-6, 2008. 31. PUTTI, A. B., UPPIN, R. B., PUTTI, B. B.: Locked intramedullary nailing versus dynamic compression plating for humeral shaft fractures. J. Orthop. Surg., (Hong Kong), 17(2): 139-41, 2009. 32. REISING, K, HAUSCHILD, O, STROHM, P. C, SUEDKAMP, N. P.: Stabilisation of articular fractures of the distal humerus: early experience with a novel perpendicular plate system. Injury, 40(6): 611-7, 2009. 33. ROMMENS, P. M., KUECHLE, R., BORD, T, LEWENS, T, ENGELMANN, R., BLUM, J.: Humeral nailing revisited. Injury, 39(12): 1319-28, 2008. 34. SARMIENTO, A., LATTA, L. L.: [Humeral diaphyseal fractures: functional bracing]. Unfallchirurg, 110(10): 824-32, 2007. 35. SARMIENTO, A., WADDELL, J. P., LATTA, L. L.: Diaphyseal humeral fractures: treatment options. Instr. Course Led, 51: 257-69, 2002. 36. SARMIENTO, A., ZAGORSKI, J. B., ZYCH, G A., LATTA, L. L., CAPPS, C. A.: Functional bracing for the treatment of fractures of the humeral diaphysis. J. Bone Jt Surg., Amer. 82(4): 478-86, 2000. 37. SCHEERLINCK, T, HANDELBERG, F.: Functional outcome after intramedullary nailing of humeral shaft fractures: comparison between retrograde Marchetti-Vicenzi and unreamed AO antegrade nailing. J. Trauma, 52(1): 60-71, 2002. 38. SCHITTKO,A. : [Humerus shaft fractures]. Unfallchirurg, 106(2): 145-58; quiz 59-60, 2003. 39. SCHITTKO, A.: [Humeral shaft fractures]. Chirurg, 75(8): 833-46; quiz 47, 2004. 40. SCHMAL, H, STROHM, P. C, JAEGER, M., SUDKAMP, N. P.: Flexible fixation and fracture healing: do locked plating 'internal fixators' resemble external fixators? J. Orthop. Trauma, 25 Suppl 1: S15-20, 2011. 41. SHAO, Y.C, HARWOOD, P., GROTZ, M. R, LIMB, D., GIAN-NOUDIS, P. V.: Radial nerve palsy associated with fractures of the shaft of the humerus: a systematic review. J. Bone Jt Surg., 87-B: 1647-52, 2005. 42. STROHM, P. C, HELWIG, P., KONRÁD, G, SUDKAMP, N. P.: Locking plates in proximal humerus fractures. Acta Chir. orthop. Traum. Čech., 74(6): 410-5, 2007. 43. STUBY, F. M., HONTZSCH, D.: [Humerus shaft fractures], Z. Orthop. Unfall, 147(3): 375-86; quiz 87-90, 2009. 44. WANG, J. P., SHEN, W. J., CHEN, W. M., HUANG, C. K, SHEN, Y. S., CHEN, T. H: latrogenic radial nerve palsy after operative management of humeral shaft fractures. J. Trauma, 66(3): 800-3, 2009. 45. ZOBRIST, R, MESSMER, P., LEVIN, L. S., REGAZZONI, P.: [Endoscopically controlled stabilization of humerus shaft fractures. The endoscope as an aid in minimally invasive osteosynthesis]. Unfallchirurg, 105(3): 246-52; discussion 53, 2002.